Sun and clouds mixed. High 73F. Winds SSW at 10 to 20 mph..
Omak’s Kyla Willard (6) and Allison Hale (11) block a shot at Okanogan Invitational tournament Sept. 16. Felicia Allen of Okanogan blocks a shot during Bulldogs' Invitational volleyball tournament Sept. 16. YAKIMA  Brewster High School’s volleyball team tied with Granger, 1-1, in pool play at the 15th annual SunDome Volleyball Festival on Sept. 15. Granger won the first game 25-13 and Brewster won the second game 25-21. Brewster and Granger each finished 5-1 in pool play. Granger advanced because it scored more points in the match with the Bears. Granger went on to win the small school tournament, topping Napavine 25-22, 25-14 for the championship. Brewster won the No. 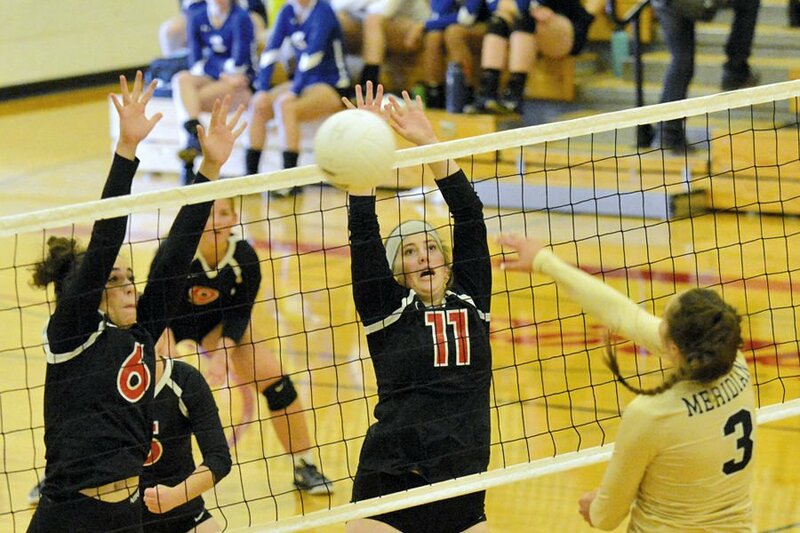 2 seed portion of the tournament 25-21, 25-13 over Coupeville in the title match, Bears coach Marcy Boesel said. Brewster stats: Brooklynne Boesel 9/10 serving, 3 aces, 5 kills, 6 assists, 6 digs; Abby Urias 2/3 serving; Karste Wright 6/8 serving, 2 aces, 2 kills, 6 digs; Maret Miller 18/19 serving, 3 aces, 5 assists, 6 digs; Marta Martinez 4/4 serving, 1 ace, 4 kills, 4 digs; Sammi Emigh 2/2 serving, 2 kills, 1 block, 3 digs; Elizabeth Stam 2/2 serving; Karina Martinez 5 digs; Elizabeth Stam 1 dig. Stats: Brooklynne Boesel 4/5 serving, 5 kills, 5 assists, 1 block, 7 digs; Abby Urias 6/6 serving, 4 digs; Karste Wright 7/7 serving, 1 ace, 4 kills 6 digs; Maret Miller 11/11 serving, 4 kills, 9 assists, 3 blocks, 8 digs; Marta Martinez 3/4 serving, 1 ace, 3 kills, 1 assist, 3 digs; Sammi Emigh 4/4 serving, 4 kills, 1 assist, 3 blocks, 2 digs; Karina Martinez 8 digs; Anah Wulf 1 assist; Elizabeth Stam 1 kill, 2 digs. Brewster against Cashmere 25-19, 21-25, 15-6. Stats: Brooklynne Boesel 13/15 serving, 3 aces, 6 kills, 10 assists, 1 block, 6 digs; Abby Urias 7/8 serving, 1 ace; Karste Wright 8/8 serving, 1 ace, 5 kills, 2 blocks, 11 digs; Maret Miller 16/16 serving, 3 aces, 5 kills, 2 blocks, 9 assists, 6 digs; Marta Martinez 8/9 serving, 1 ace, 1 kill, 1 block, 2 digs; Sammi Emigh 5/5 serving, 1 ace, 1 kill, 2 assists, 1 block; Anah Wulf 4 kills, 1 block, 2 digs; Karina Martinez 2 digs; Elizabeth Stam 3 digs. Brewster beats Heppner, Ore., 25-19, 25-22. Stats: Brooklynne Boesel 6/7 serving, 8 kills, 7 assists, 1 block, 10 digs; Abby Urias 11/11 serving, 1 ace, 3 digs; Karste Wright 9/10 serving, 2 aces, 4 kills, 8 digs; Maret Miller 6/8 serving, 3 kills, 9 assists, 1 block, 3 digs; Marta Martinez 7/7 serving, 2 aces, 3 kills, 2 assists, 1 dig; Sammi Emigh 1/1 serving, 2 blocks; Karina Martinez 5/5 serving, 4 digs; Anah Wulf, 1 assist, 1 block; Elizabeth Stam 1 block; Zulema Sotelo 1 dig; Ana Aparacio 2 digs. Stats: Brooklynne Boesel 9/9 serving, 1 ace, 6 kills, 8 assists, 8 digs; Abby Urias 5/6 serving; Karste Wright 7/7 serving, 6 kills, 3 digs; Maret Miller 10/10 serving, 2 aces, 3 kills, 7 assists, 7 digs; Marta Martinez 11/12 serving, 1 ace, 1 assist; Sammi Emigh 5/6 serving, 2 aces, 2 kills, 3 blocks, 1 dig; Anah Wulf 1 kill, 1 assist, 1 block; Karina Martinez 2 digs; Elizabeth Stam 2 digs. “I didn’t know what to expect from the team that won the 1B state championship two years ago,” coach Dowers said. “They were still solid, with two very good players that came up through their championship teams. They were also a bit better at tournament play, as they had a little more endurance between the ears than we did. Pateros tournament stats: Sarah Poole 8 kills, 43/49 serves w/14 aces, 3 assists, 23 passes, 40 digs; Jissele Ornelas 2 kills, 5 passes; Samantha White 10 kills, 19/25 serves w/2 aces, 2 assists, 32 passes, 29 digs; Andrea Baird 2 kills, 8/13 serves w/1 ace, 15 assists, 6 digs; Ashlyn Gonzalez 2 kills, 25/29 serves w/4 aces, 26 passes, 48 digs; Jahaira Hernandez 3 assists, 2 passes, 6 digs; Taylor Harrild 7 kills, 19/25 serves w/8 aces, 7 passes, 4 digs; Anna Williams 8 kills, 22/26 serves w/3 aces, 14 assists, 5 passes, 12 digs; Jillian Piechalski 1 kill, 4 digs. Bridgeport went 2-4 in pool play and advanced to the No. 4 seed tournament. In pool play, the Fillies split with Waitsburg 25-23, 1-25, split with Selah JV 8-25, 27-25; and lost to Goldendale 6-25, 15-25. In the No. 4 seed tournament, Pateros topped Bridgeport 25-23, 25-21. River View won 22-25, 26-24, 15-4 over Christian Faith for the pool title. In the consolation bracket, Riverside Christian edged Bridgeport 21-25, 25-14, 15-8. OKANOGAN – Colfax finished first at the 2017 Okanogan Volleyball Invitational tournament Saturday. The Bulldogs topped Toutle Lake 25-16 and 25-20 for the title. In the match for third and fourth, Meridian turned back Okanogan 25-13, 25-13. In the match for fifth- and sixth, Omak prevailed 25-16, 23-25 and 15-12. For seventh and eighth places, Waterville-Mansfield squeaked to a 25-21, 21-25, 15-12 victory over Davenport. In earlier pool play, Okanogan finished at 2-1. Omak was 1-2 in pool play. CUSICK – Republic knocked off Cusick 25-16, 25-8 and 25-17 in a Northeast 1B League volleyball match Saturday. Republic stats: Anna Silva 7 aces, 11 assists; Carlie Rittel 6 aces, 4 kills; Corbin Silva 4 kills; Summer Jones 6 digs; Mary Groom 3 blocks. Selkirk won 25-16, 23-25, 25-21 and 25-11. Republic stats: Mary Groom 5 aces, 8 kills; Carlie Rittel 8 kills, 5 blocks; Summer Jones 15 digs; Anna Silva 20 assists. Republic is at Wellpinit on Saturday. TONASKET – Tonasket swept aside Waterville 25-22, 25-17 and 25-14 in a Central Washington 2B League volleyball match Sept. 14. The Tigers wore special Scottie pride ribbons at the match in support of the students and staff at Freeman High School, said Pamela Leslie. A shooting at Freeman on Sept. 11 left one student dead, three others injured and another student arrested. The crowd observed a moment of silence. “Our community supports the wonderful people from Freeman,” Leslie said. The Tigers served 97 percent with 14 aces and 19 kills. Stats: Taylon Pilkinton 9 kills; Lauren Ellis 4 kills. COULEE DAM – Lake Roosevelt High School’s volleyball team topped Oroville, 25-17, 26-24 and 25-14 on Thursday. The Raiders, down in the second set, closed the gap on serving by Emily Abel. Still down by four, 24-20, Lake Roosevelt pulled out the set on the serving of Sean Garvin and the hitting of Olivia Ludwig. The Raiders finished with 17 serving aces, 22 kills, 20 assists, 4 blocks, 16 digs and 92-percent serving. L.R. stats: Garvin 5 aces, 7 ki9lls, 9 assists, 2 blocks, 94 percent serving; Addison Hansen 6 kills, 3 digs, 100-percent serving; Ludwig 3 aces, 6 kills, 2 digs, 83-percent serving; Chasity Williams 100 percent serving, 2 aces, 6 digs; Abel 3 aces, 100-percent serving (17/17). MANSON – Omak topped Manson, 3-1, in a non-league volleyball match Sept. 14. The Pioneers prevailed 11-25, 25-15, 25-16 and 25-18. 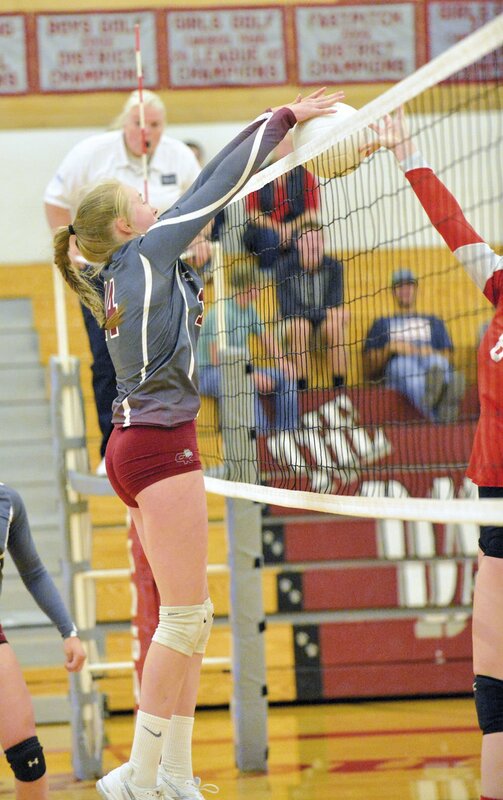 “The Trojans worked hard against the tough Omak team, but lost momentum after the first set and struggled in serve receive,” said Manson coach Hayli Libbey-Thompson, whose team was home following a three-game road trip. WATERVILLE – Lake Roosevelt won 25-17, 25-22 and 25-12 over Waterville in a league volleyball match Sept. 12. “We played around with a couple of rotations again; it proved to be a great night to work on different things,” Raider coach Kasey Garvin said. Stats: Sean Garvin 8 serving aces, 5 kills, 9 assists; Addison Hansen 8 kills, 2 blocks; Chasity Williams 100 percent serving; Emily Abel 100 percent serving. REPUBLIC – Republic fought back from dropping its first set to dispatch Northport 22-25, 25-10, 25-17 and 25-20 in a league match Sept. 12. Republic stats: Corbin Silva 4 aces, 8 kills; Summer Jones 4 aces; Kailee Rittel 4 aces; Carlie Rittel 12 kills, 6 blocks; Anna Silva 19 assists; Mary Groom 7 digs; Mackenzie Hutton 5 digs. INCHELIUM - Inchelium topped Curlew 3-0 in a league volleyball match Tuesday. Inchelium won the first two sets 25-15 and 25-17. The third set was a humdinger, with the Hornets finally prevailing 31-29. Curlew stats: Korin Baker 12 kills, 2 digs, Megan Joe Beedle 6 assists, Maddie Calhoun 2 digs. Inchelium stats: Meika Heath 18 kills, 4 aces; Kaylee Seymour 12 assists, 4 aces; Randi Finley 12 assists, 4 aces; Rylee Desautel 4 blocks; Tayah Kohler 3 digs.